You can select a type of project from this page of the wizard. This project type will determine the toolchain and data, and tabs that the CDT uses. 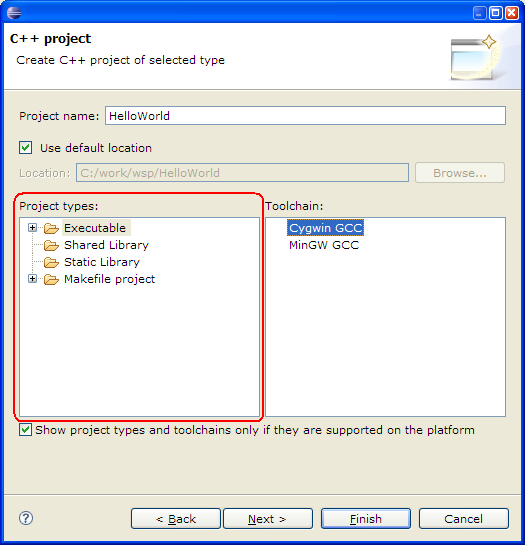 Once created, C/C++ projects display in the C/C++ Projects view. Project Type Specifies a project type from the list provided. Show Project Types and toolchains only if they are supported on the platform If checked (default), list is filtered so that only project types that are buildable on the host system are shown. If unchecked, lists all known project types in the Project Type list.